Mordian 7th Regiment: Necromunda - Shipping Container Shops Complete! 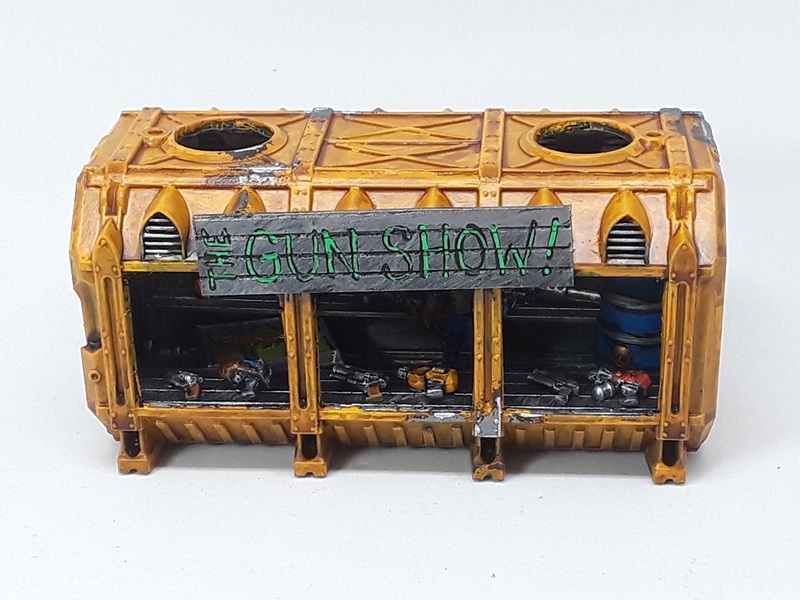 Got some brush time in recently and was excited to finish up the container shops for the Necromunda board! 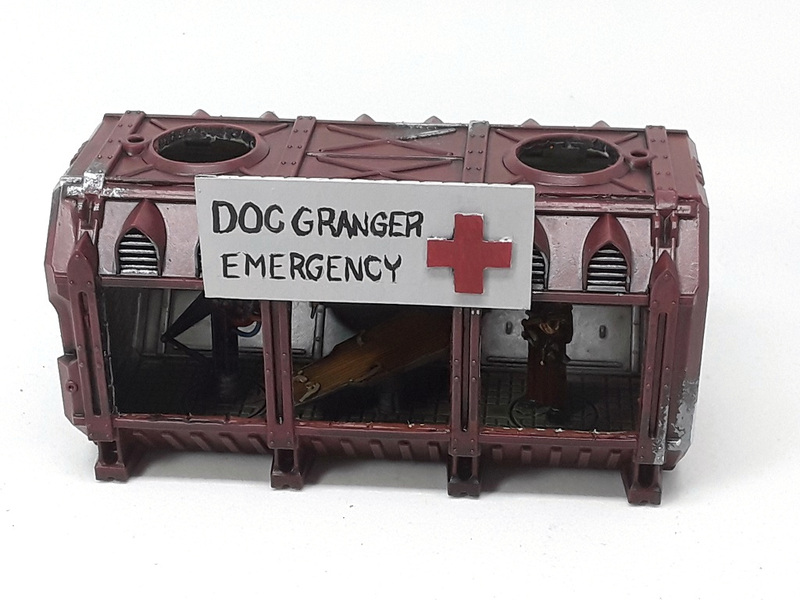 Sadly, after painting the interiors, I dry fit them together and in doing the painting and washing of the exteriors they essentially glued themselves shut. Doh! First up, The Gun Show! 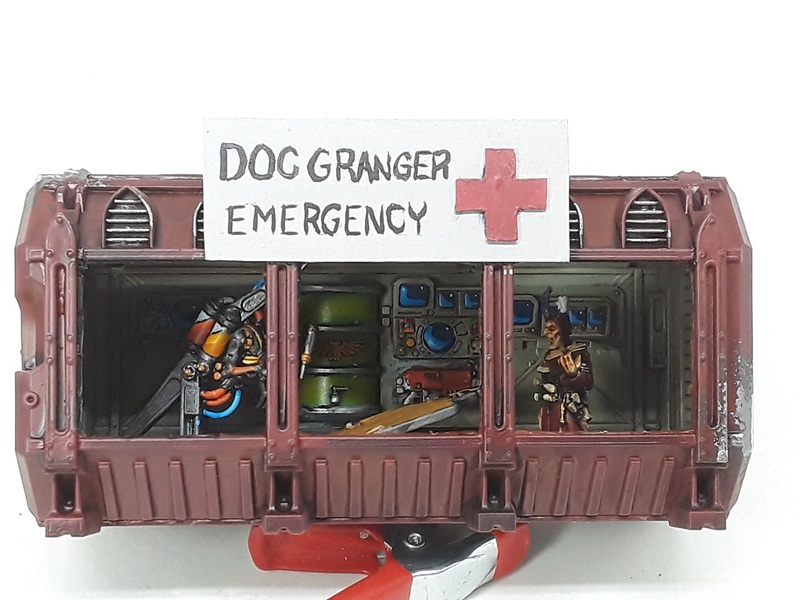 Found a Chronoscope miniature with a wrench and a power fist which I thought worked well for the salesman, and am quite happy with the technicolor weaponry - Suitable for the neo-punk nature of the Underhive! 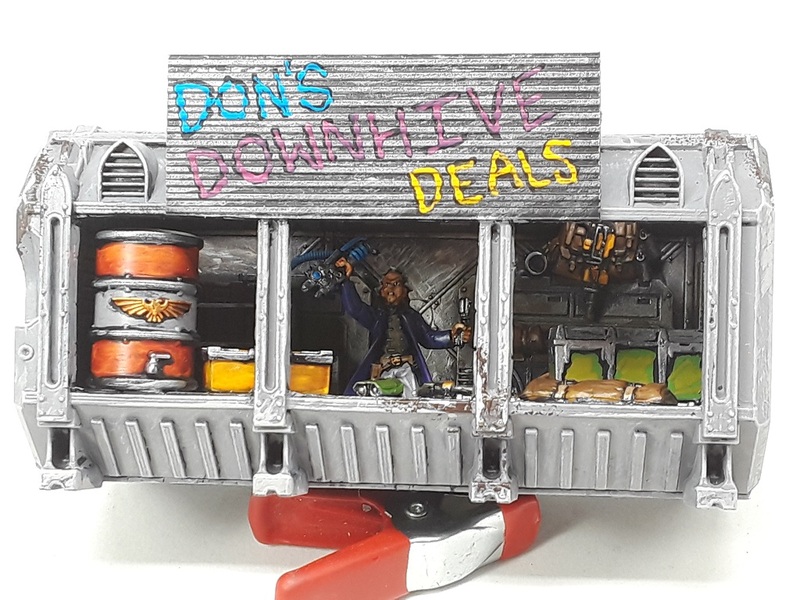 Next up is Don's Downhive Deals - Dealin' Don ended up looking pretty manic, which I thought worked well! "DO YOU NEED ISOTROPIC FUEL RODS? DEALIN' DON'S GOT ISOTROPIC FUEL RODS! ...AND A 50 GALLON DRUM OF RECAFF! ...AND I'M ON MY THIRTIETH CUP!" All in all I am really happy with how they turned out, and am looking forward to getting them on the table! 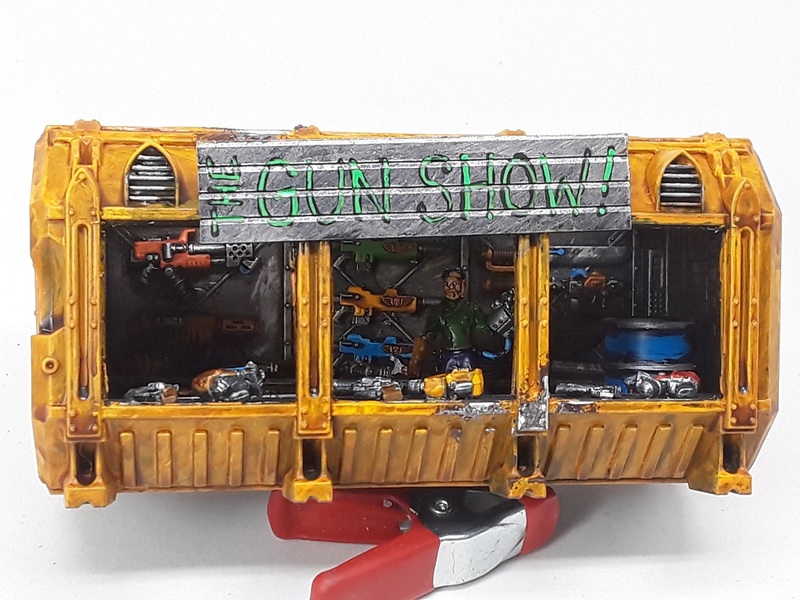 Welcome to the Gun Show! 8) .. nice man they came out really nice! If you need some laser cut signs man let me know.. Such a brilliant idea, and so excellently executed! Well done indeed! I appreciate it! They were a hoot to build! Thanks! Aye, I'm gonna get out the white and micron pens tonight! Looks even better with paint. I do agree about the doc sign, it needs some re-work. Which I had a gaming board, this would be an excellent idea for a bazaar area in a bombed out city. Oh seeing as you yout point it out, I guess we all hope the doc would have a steady hand... those poor underhivers! There are very cool! Some lovely thematic pieces. Thanks very much! 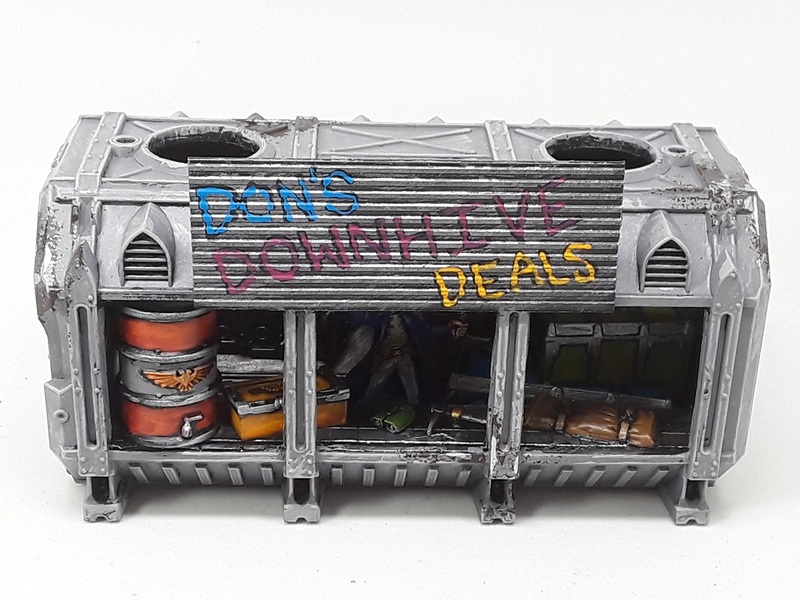 They should add a touch of whimsy to the Necromunda tables! Great stuff. I wouldn't worry about the signs too much. The fact that they are shipping container stores suggests something a bit temporary and frontier town anyway. Cheers, bud! Aye, for the most part the slapdash lettering suits 'em! Brilliant, brilliant, brilliant and finally brilliant!! Thanks man! They were a hoot to build and paint! Holy heck mate, they are so cool. Now you need to make some multi-level shanty hab-block style buildings to put around them. Love the container stores. Any chance of a galvanic servo hauler (or a couple of Ogryn power lifter servitors) for when the market needs reconfiguring? Sounds like a great scenario. Looking forward to seeing and/or reading about that. Absolutely! They were a blast to build, can't wait to see your take on 'em! These are awesome! Great work, man.